June | 2015 | Brainder. 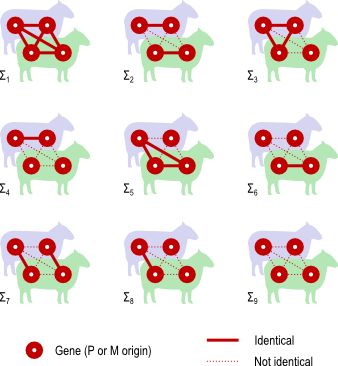 The degree of relationship between two related individuals can be estimated by the probability that a gene in one subject is identical by descent to the corresponding gene (i.e., in the same locus) in the other. Two genes are said to be identical by descent (ibd) if both are copies of the same ancestral gene. Genes that are not ibd may still be identical through separate mutations, and be therefore identical by state (ibs), though these will not be considered in what follows. The coefficients below were introduced by Jacquard in 1970, in a book originally published in French, and translated to English in 1974. A similar content appeared in an article by the same author in the journal Biometrics in 1972 (see the references at the end). Consider a particular autosomal gene . Each individual has two copies, one from paternal, another from maternal origin; these can be indicated as and for individual . There are 15 exactly distinct ways (states) in which the can be identical or not identical between two individuals, as shown in the figure below. A similar method was proposed by Cotterman (1940), in his highly influential but only much later published doctoral thesis. The , and correspond to his coefficients , and . If and are in fact the same individual, then is the kinship of a subject with himself. 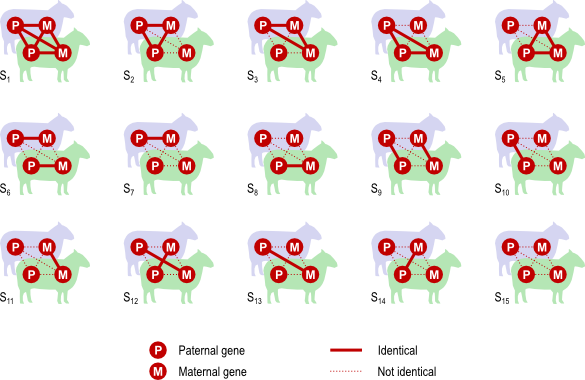 Two genes taken from the same individual can either be the same gene (probability of being the same) or be the genes inherited from father and mother, in which case the probability is given by the coefficient of kinship between the parents. In other words, . If both parents are unrelated, , such that the kinship of a subject with himself is . For a set of subjects, the pairwise coefficients of kinship can be arranged in a square matrix , and used to model the covariance between subjects as (see here). Note that all these coefficients are based on probabilities, but it is now possible to identify the actual presence of a particular gene using marker data. Also note that while the illustrations above suggest application to livestock, the same applies to studies of human populations. Cotterman C. A calculus for statistico-genetics. 1940. PhD Thesis. Ohio State University. Jacquard, A. Structures génétiques des populations. Masson, Paris, France, 1970, later translated and republished as Jacquard, A. The genetic structure of populations. Springer, Heidelberg, 1974. Jacquard A. Genetic information given by a relative. Biometrics. 1972;28(4):1101-1114. 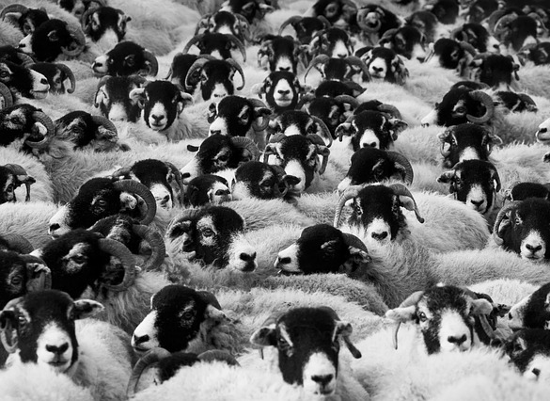 The photograph at the top (sheep) is in public domain.